For some reasons women who have straight hair dream about curly one. But those who have curly hair always complain about its disobedience and regularly straighten it. Sometimes it is a huge deal for women with thick afro-textured hair. Such hair is complicated and challenging to style. Moreover, a woman with such hair usually have some difficulties while choosing an electric straightening brush. That`s why we prepared a review on best straightening brushes which straightenings that best fit such hair type. If you want to make your locks look perfectly straight and smooth, it is more likely you will use the hottest temperature of the straightening tool. That`s why you should buy an electric brush with unique protection properties and do not forget to use care hair products. Let`s observe the best. Main features of the Magictec hair straightener are a LED display, an adjustable temperature (330-430°F) and a scald protection. It is also very stylish and lightweight. The brush shuts off after 60 minutes of non-use. 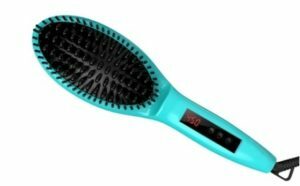 The brush generates negative ions, that means that it will eliminate frizz and promote healthy hair. The FemJolie straightening tool has a ceramic heating surface, automatic shut-off, and an anti-scald design. It is compact and does not weigh much. 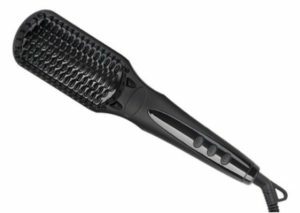 The brush can heat up to 450°F (230°C) in 3 minutes and can straighten any hair type. Moreover, its negative ions beneficially effect on hair, protect it from damaging and does not cause static electricity. 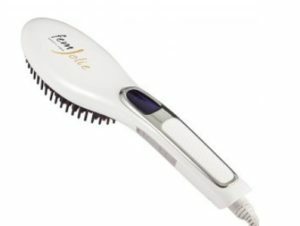 MiroPure hair brush has double anion spray, a built-in ionizer, a LED screen and 16 temperature settings. It is lightweight and compact. 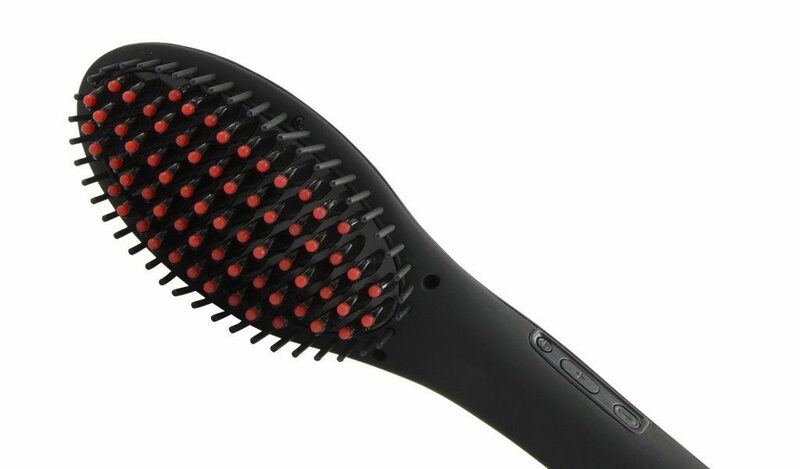 Due to its ceramic heating element, the brush heats up quickly and distributes the warmth evenly. Its dense crescent-shaped bristles make it easier to reach the roots of the hair. Also, it has a shut-off function. 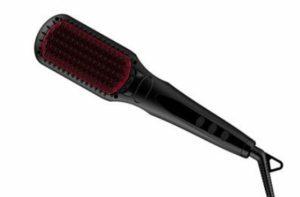 This straightening brush is dual-voltage, and its temperature ranges from 290°F to 450°F. It has double anion spray, a ceramic heater, and an easy to read LED screen. The straightener is rather small and portable. The head of the brush is rectangular and has rounded edges. It heats up to 450°F in 30 seconds. The soft crescent-shaped bristles will gently brush your hair without pulling it out. Gisala electric hair brush has 5 temperature settings (300-450°F), 2 gloves for more safety and hair clips are included in the kit. It also has a stylish anti-scald design. That is why you should not be afraid of being burnt while straightening your hair from the very roots. The bristles of Gisala Straightening Brush are crescent-shaped. And a built-in ionizer keeps hair healthy and shiny. Besides, it shuts off after 30 minutes of non-use. So as you see above, these straightening brushes have enough power to straighten even the thickest and the curliest hair. They also provide excellent hair care that reduces chances of hair damaging. Choose any straightener you like and start straightening your curlies! I want to buy a hair straightening brush for my younger sister (14 years old). She is dreaming about a hair straightener. Her hair is black, long, curly and very frizzy. I was wondering if such a tool fits girls of her age? Is it safe enough? It is a common situation for teenage girls to start thinking about their appearance. Be sure, that a hair straightening brush will be safe enough for your sister. We especially recommend examining the Gisala Straightening Brush. 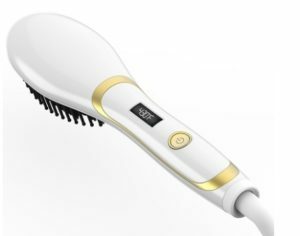 We love this brush for its cool-down mode and the built-in ionizer. It helps not only prevent damaging hair, but it also makes it looks much healthier.